D'Onofrio's Food Center has a rich history in serving the people of the Shenango Valley since 1916. Founder, August D’Onofrio started our grocery store right in his home. When time came to expand, he bought the vacant lot across the street and built a neighborhood grocery store. 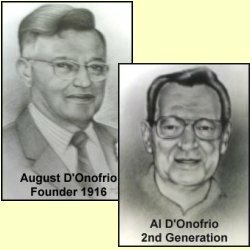 Albert D’Onofrio, August’s son, had moved the store’s location to where it is currently located in Hermitage, PA on April 29, 1964. After many years of serving the community, the store underwent a remodeling in February of 1989 to increase the store floor, increase the size of our Deli and Bakery departments and added our front service counter. Current store owner Joseph D’Onofrio, Albert’s son, can be found throughout the store helping inquiring customers and answering any questions customers may have. Now into our fourth generation, Albert D’Onofrio, Joe’s son, can also be found throughout the store helping customers. Al is continuing the tradition of offering the highest quality products and services to our loyal customers.